Throughout Ireland, Britain, and Europe country houses were designed to impress, inspire, beguile but perhaps most of all to entertain; they became centres of hospitality and leisure where days were filled with all manner of activities including dining and photography, artistic pursuits and theatricals, from blind-man’s buff to taxidermy. The Country House was where marital matches were made, political alliances cemented, and wealth displayed. Lavish entertainment was often the means of achieving these ends. Recreation in the Country House was not confined to the indoors. The estate’s parkland was frequently utilised for the entertainment of family, friends, indoor staff and estate employees. From the slow pace of gardening to the fast pace of carriage driving, estates were a hive of activity. 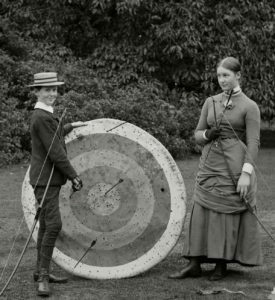 Within the demesne walls archery, croquet and shooting were a matter-of-course. Moving into the nineteenth and twentieth centuries, the use of estate lands for football, cricket, golf and other sports played a key role in opening up demesnes to the wider community. Sport and leisure also provided a means for the elite to engage with the local community. Hunting, racing and yachting provided entertainment not only for landlords and their society, but also a spectacle for the wider community. Estate tenants and employees pursued their own leisure and sporting activities, sometimes thanks to landlord benevolence and sponsorship, at other times in direct opposition to landlordism, for example, ‘stopping the hunt’ in Ireland during the Land War of the 1880s was a leisure pursuit in its own right. Over the past century countless historic houses have continued to become more outward facing and have become attractive visitor destinations in their own right. Sport and leisure continues to play a significant role in this transformation, and in creating an attraction that appeals to a wide cross-section of the public whose idea of leisure and recreation includes cultural tourism.